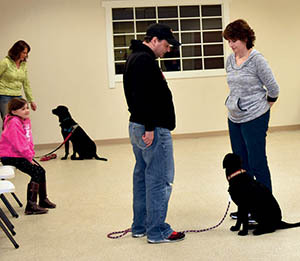 Group classes are held on the second floor at Crest View Animal Clinic in Lincoln University, Pennsylvania (near Landenberg). 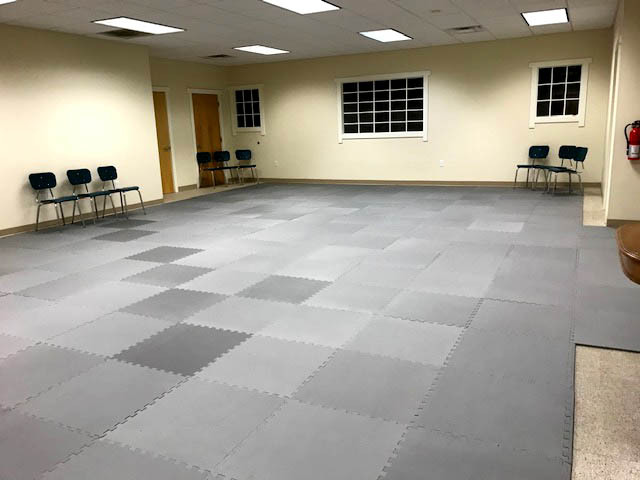 The training room is bright & clean with heating and air conditioning. And new for 2019 - half an inch of eva foam for great cushioning & a non-slip surface. Courses range from Puppy Pre-K to Advanced - please contact Susan if you have any questions regarding which course would be appropriate for your pet. With classes limited to 5 dogs, you can be sure you & your dog will get the personal attention you need. All family mambers are encouraged to attend - the classes are fun! We encourage you to observe a class & carefully read the course descriptions to be sure the course you are signing up for best fits your needs. The tuition fee reserves your spot for the entire course. Withdrawal from the class must be made 48hrs before the course begins in order to get a refund. If you must switch from one course to another, you must discuss that with Susan directly, at least 48 hours prior to the start of the original course start date. Please contact Susan if you have any questions about the group classes. 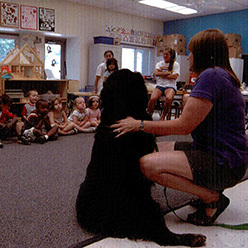 "Susan maintains an upbeat, reassuring learning environment for students (human and canine!). I have learned a ton with my own dogs plus shelter dogs I’ve brought through - I keep coming back because the dogs love these classes!" This is a course for the baby dog. The foundation skills for setting your puppy up for success in your home and abroad will be addressed and there will be opportunity for socialization with classmates, friendly adult dogs, and people. 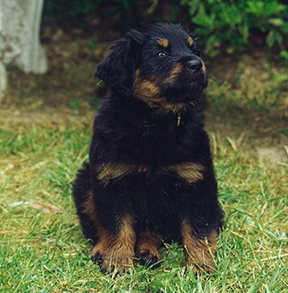 Start your puppy out on the right paw! * Puppies must be under 16 weeks of of age at the start of the course & current with the vaccinations that are appropriate for their age (please ask us or your vet for more info if needed). In this course you will learn how to teach your puppy or dog how to be a well mannered member of the family. * Dogs must be current with the vaccinations that are appropriate for their age (please ask us or your vet for more info if needed). Ideal for those with an adolescent dog, any dog that could use more work on appropriate behavior, or those who are preparing their dog for dog sports. Build on what you learned in Beginners to teach your dog to respond to you in the face of distractions. Workshops will be a short series of classes (3 or 4 weeks long, meeting 1 night a week for an hour). 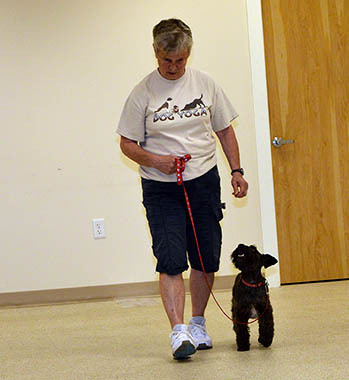 The workshops will concentrate on very specific topics, such as Prep for taking the AKC Canine Good Citizen Test, heeling & loose leash walking, recalls, stays & tricks, amongst others. Dogs must have completed Level 2 or an equivalent course elsewhere. Workshops will be offered periodically throughout the year. Stay tuned. 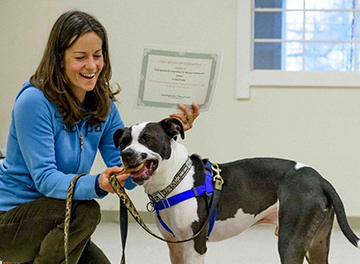 This course is for graduates of Level 2 who are interested in going further with their dogs. 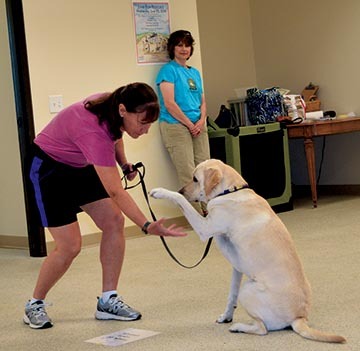 These ongoing lessons will cover preparation for therapy dog certification, obedience or rally competition, finessing of Canine Good Citizen certification skills, and exercises for those who simply want to keep their training skills current.